A new series on Fox I think it is called The Good Guys has a 79 in it. It comes on tomorrow after Idol looks really funny. has anyone seen the pegasus motorcars pontiac firebird custom? 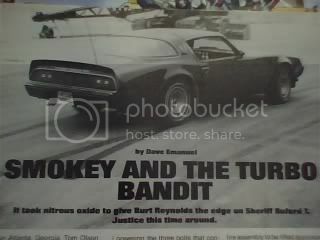 a guy at work owns it and says it was in bl stryker and burt actually drove this car. its made out of an early 80's 3rd gen bird. all black with a wierd long nose and extremely wide body kit. Help me with my old age memory, was there a scene in smokey and the bandit where a state trooper in a Trans am pulls up behind the bandit then he runs out of gas and drops out of the chase, I thought I remembered this but I bought the dvd and didn't see it, maybe I've watch too many car chases and got them mixed up? I've seen way to many as well - but the scene you may be thinking about (and i'm not too sure either) is from Cannon Ball Run where a firebird cop car chases the Lamborghini driven by the women and they floor it and leave the cop in their dust - looks like he runs out of gas compared to how fast they take off. yes that was cannonball run 2. man I love that movie. I watched a new show called Rookie Blue and they were doing a prostitute scene and showed a car lot and it had a 79 - 81 Trans Am in it. Anybody else see it? dont forget the beginning of thunderbolt and lightfoot when lightfoot(jeff bridges) steals a 73 trans am from a dealership and rescues thunderbolt(clint eastwood) from getting shot at the beginning of the movie. good flick! They missed the remake of "The Hitcher". It had a black 1979 SE.